This is a review of the Akai MPK261 Midi Keyboard. You can find the detailed specifications on the Akai website. I only explain the particularities that are not obvious on the web site. Most of the information here applies to MPK249 and MPK261. Some of it applies to the MPK225. 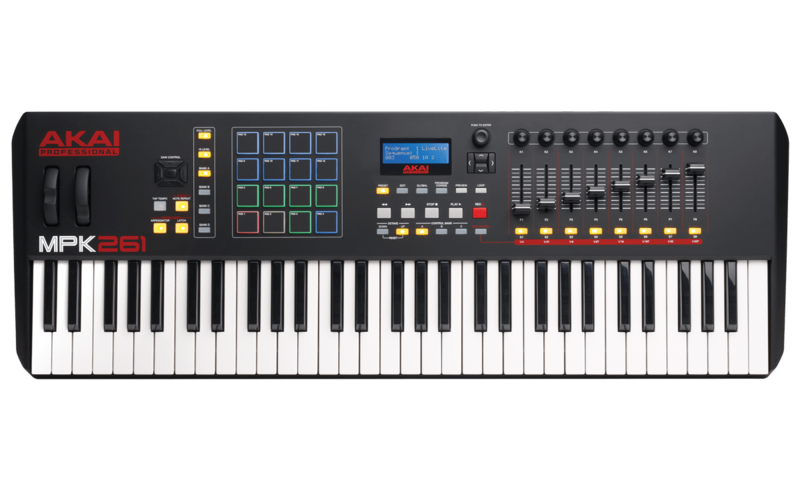 The Akai MPK 261 is a new product and is just becoming available in stores (as of this writing, of course (2014/6/21, around $500)). My setup in the studio includes a full 88-key keyboard, various Digital Audio Workstations (DAW) controllers and pedal boards but I can’t carry all of this easily. For example, the fully weighted 88-key keyboard weighs 55 pounds (without the stand). When I travel with a suitcase, I carry my trusted, old, M-Audio Oxygen 49. The 49 key Oxygen is too small for comfortable playing, although it is perfect for learning new tunes and licks. It has some DAW controls and is lightweight. My 88-key Casio has perfect key feel and decent sound for practice. It connects via Midi to other equipment and computers. It is not portable (well…maybe). So a 61 key is a perfect size for stage playing. I can use an octave switch if I need to play more notes occasionally and the length of the keyboard makes it easy to carry. I have tried an M-Audio Axiom Air 61 and, while the included software and Hypercontrol functionalities sound excellent in the marketing copy, nothing really works as expected and numerous bugs cause the keyboard to completely freeze at random intervals (needing a reboot). This is not viable in a show environment. So, although the Akai brand is now owned by the same company as M-Audio (InMusic also owns Alesis, Numark and Sonivox, to name a few) they seem to develop different products. I’m guessing that each company is still quite independent as far a product development goes. That might change in the future, as some of the products are competing for the same market segment. The Akai MPK261 is heavy! The base is metal sheet and the unit is built like a tank. It is relatively compact because the Pitch Bend and Expression wheels are above the key bead. The multitude of buttons, knobs and sliders need quite a bit of space so the keyboard is quite deep (but less than the M-Audio Axiom Air 61). The professional black finish is good and the red base, visible on the back, adds a nice accent. The MPK2 series is not a synthesizer, meaning that it will not make sound by itself, or even hooked to an amplifier and speakers. It is strictly a Midi generating device. The MPK261 comes bundled with a good selection of software, for Mac and Windows, that might be a good selling point if you do not have your own already. MPC Essentials is especially interesting. 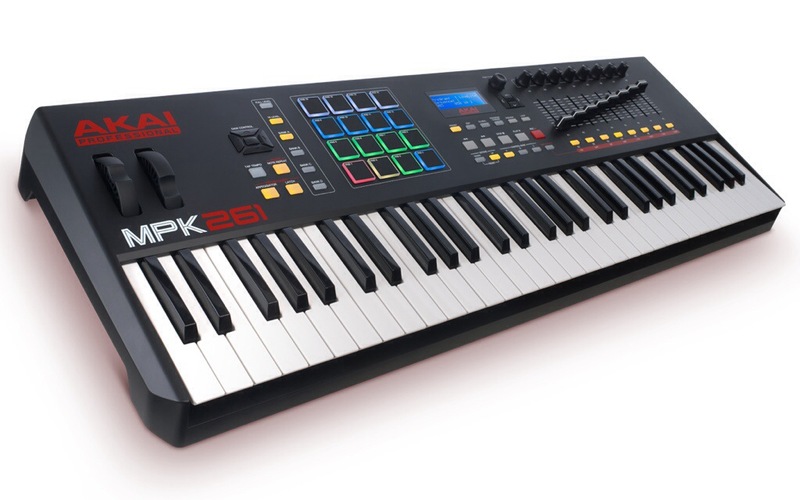 The MPK261 has 16 pads and some of the functionalities of the MPC series of midi controllers. Pads on keyboards are common now and Akai has vast experience with them. The pads on the MPK2 series are great. The MPK261 is a semi-weighted keyboard. This is supposed to mean that the keys are similar to a normal, fully weighted, keyboard and less soft that a “synthesizer” or”organ” type keyboard. I have never used a semi-weighted keyboard that didn’t just feel like a stiffer synth keyboard. The MPK261 is no exception. The key feel is good, but the “semi-weighted” monicker is just marketing talk. Although I have not opened the keyboard (yet), I’m guessing that the action is just using variable density springs to mimic the weight of a real keyboard. A standard “synth” keyboard uses equal density (read regular) springs. The key response is great and fast and the keys are well polished with slightly rounded angles so they don’t catch on your skin when you play fast. This is a matter of taste, as some players prefer keys that are rougher to prevent finger slippage, especially with humid or wet hands (as in sweaty). Since the keys are not very stiff, it is easy to hit the neighbouring keys if your finger action is not absolutely precise. This is a “feature” common to all non-weighted keyboards. The width of the keyboard, with its 61 keys, is about a 1/4 inch (5 mm) narrower than the equivalent keys on a full keyboard. This does not make a significant difference but a trained piano player will sense it. The length of each key is about 1 inch (25mm) shorter than a regular keyboard (a hair over 5 inches long versus 6). This is a very noticeable difference and a typical pianist will have quite a surprise when switching to a smaller keyboard. Note that smaller keys are not the exception for electronic keyboards. All of mine have keys of varying sizes, from quite short on the M-Audio Oxygen 49 to near-normal on my Casio 555. That said, the MPK261 has some of the smallest keys I’ve seen. You will definitely have to adjust your playing style on this keyboard. If all you do is activate synthesizer sounds one key at a time or only play full chords, the action is fast and predictable. If you play classical music, Jazz or in any way have been trained on a regular piano, you will spend some time adjusting your hand positions. The most noticeable difference is when playing the black keys. I find that pressing the black keys when, for example, playing a chord so that my longest fingers (index, mid and ring) hit the black keys, I touch the keys near their root. Because of the difference in the action (mainly the pivot point), the black keys need more pressure to achieve the same sound force the closer you press to the root. Luckily, the MPK261 has a parameter for this particular adjustment (see below). 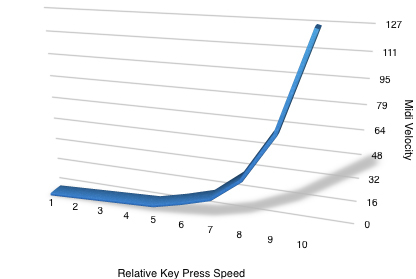 All cheap (relatively, as the MPK261 cost $500) keyboards use velocity calculation to approximate the force used to press on a key. Instead of a mechanical action that transfers the force to the hammer that strikes the string (as in a regular piano) or that strikes a sound pickup (as in many vintage electric pianos), electronic keyboards use speed instead of force. They map the speed of the key press to a velocity curve that is supposed to correspond to the force of the impact of a regular key. This is better than nothing as I remember that my first few keyboards didn’t have velocity calculation. The notes where either ON of OFF, more like old synths or organs would do. The keys on the MPK261 have adjustable velocity curves. They are way too soft out-of-the-box and it takes very little pressure to get a 127 Midi value on the output. The Gain parameter will let you set a relative effort needed to apply the chosen velocity curve. It seems to be a shift applied to the velocity curve. 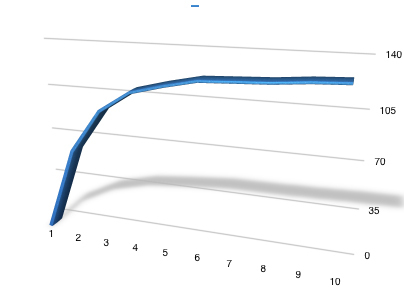 If the value is low, the curve shifts upward (relative to 0), meaning that more force will be needed to generate a note. Inversely, a higher value will shift the velocity curve downward. Generating a note will require less force. It flattens or expands the velocity curve. Finally, the black/white offset parameter will let you adjust the relative velocity of black and white keys. In my case, for example, I found that a black value of -5 will let me play the black keys with very similar values to the white keys. I set my parameters to : Curve -6 to -10, Gain -6, Black -5. This is a trial and error process. I played different styles of music and looked at the values coming out of the keyboard (using Midi Monitor on a Mac). I also listened to many sound generating programs to figure out the best velocity arrangement. I love this particular way of adjusting the velocity curve although you should note that this is a Global Parameter, meaning that the keyboard will react the same way in any software. This is annoying as different synthesizers will react differently to incoming velocity changes. For example, in Ableton 9, the Grand Piano will tend to smooth ou the incoming velocity curve based on a series of parameters in its setup. It is generally adjusted with the Hardness macro command but can be fine tuned as well. The Sonivox Eighty Eight Ensemble software included with the MPK261 sounds marvellous but is reacting very differently to key velocity, to the point of being very hard to use. I end up using different velocity curves depending on the software I have producing sound at any point. The problem is that the velocity parameters are stored in the Global Parameters set and cannot be adjusted by switching presets. That’s a feature that Akai should include in future firmware releases: let the user assign the global Velocity Parameters to a Preset or have theses parameters modified for a Preset. The Pitch Wheel and Expression Wheel are placed above the keyboard, on the left. This is my preferred arrangement as I rarely use Pith Bend and having it on the left side of the Keyboard adds six inches to the with. To conclude, I love the key action despite the small key size. I would prefer a tighter spring to allow me to better modulate the velocity, especially when playing smoothly. Since I often switch keyboards, that also demands constant adjustment. The Velocity parameter adjustment is great if you spend the time to do it carefully. The keys have channel aftertouch and sadly, no release velocity. I must admit that I seldom use release velocity but I like it with some guitar effects. The Mpk261 is divided into sections. We’ve covered the keyboard already. The next section is the DAW. This is a small section of five buttons that will send actual regular computer keyboard messages to your computer, like ENTER, RIGHT-ARROW, etc. This is all modifiable. This is a great way to control some parameters on your computer without having to touch it. Below the DAW sections four keys let you adjust Tempo, Pad repeat, Keyboard Arpegiator and Arpegiator Latch. The Tempo button flashes according to the tap tempo that you adjust. If the tempo is controlled by an external source, it will be turned off. I would love to see it flash to the tempo set in my software. I like to have a visual cue for tempo and the MPK261 has very bright lights. Next to the tempo button is the Repeat button. This is linked to the Pad Repeat only. The arpegiator is also linked to the tempo button. If the tempo is external, the arpegiator funciton is off (or controlled by the computer). Note: The arpegiator only works with the keys, not the pads. To the right, the PAD section. The pads on the MPK261 are simply the best that I have used. They are fixed, meaning that they don’t go down when you push. They are very sensitive, have poly aftertouch and are controlled by some Akai MPC functionalities like 16 level, HI level and pad repeat. Each pad is lit by RGB LEDs. You can choose the color (ON and OFF). It might look a bit over the top, but it adds a lot a visual “ah!” to the MPK. Plus, it can be assigned to each Preset so you have quite a bit of control over the color. In a future post, I will show you how to change the color “live”, from you DAW software. The display section has associated buttons on the right. The display has good contrast and presents the information logically. I would like to see it put in at an angle. This would make it easier to read. Also, a bigger display would prevent having to navigate right and left to go through a series of parameters. I know that 20 characters-4 lines displays are dirt cheap (I pay $7) and make a difference for volume production dollars, but in this day and age, a graphical display, even color TFT or OLED, is available for just a few dollars. Also, this is a $500 keyboard. The rotary encoder makes it easy to navigate through the parameter choices and a press will select one. The navigation keys are logically placed and responsive. Below the display you will find the Modes buttons. They let you choose between Preset, Edit, Global and Program display modes. The preset are what’s called banks or patches on other controllers. They are named set of parameters stored in permanent memory in the MPK261. Most of the keyboard parameters are stored in a preset. The MPK261 comes with a set of Presets for the included software and many other popular software DAW. Contrary to M-Audio product, there is nothing fancy about the Presets and their interaction with the DAW. They only allow you to choose a set of Midi parameters that are associated with the buttons and other controls. This might seems limited, but I have run into so many problems with keyboards that try to couple very tightly with software running on computers that I now vastly prefer to do it the Akai way. Just send Midi commands when I press a button, a pad, a key, etc. The Presets are stored in the Keyboard memory. Luckily, you can export them to you PC or Mac as SysEx and use a SysEx librarian (or you DAW) to store and transfer an infinite number. In a future post, I will show you how to modify the Presets on your computer and upload them on your MPK. So the Presets are done right: customizable, flexible and you can store 30 on the keyboard, plus an infinite number on your computer. You choose them by name (editable). On the down side, the Presets don’t store the global parameters. After you edit a Preset, don’t forget to save it before you call another Preset or you will loose your changes. If you press the Edit button after you have touched any control the screen will present information about that control and its current configuration. There are many parameters associated with each control. Pages in some cases. Take the time to learn them. This is where the power of the MPK becomes apparent. You don’t have to save each Edit, but remember to save the whole Preset before you switch to another one or you will loose all your changes. The Global button gets you into Global Parameter Edit Mode. You get to change values for Keyboard Velocity Curve which, as I mentioned above, should be stored with the Presets. Same thing for the Pads velocity curve and Tempo behaviour. Global will let you send the Preset SysEx files to a computer one by one or all at the same time. As far as I’m concerned, the only parameters that should be Global are Midi Channel, Note Display (as in show note name or just note number) and the Global SysEx Send. The rest belongs to each Preset. This mode lets you send a Midi Program Change down the Midi line. Nothing fancy. You can send a standard Program Change, with a value of 0 to 127, or a Banked Program Change, which will send a Bank address (MSB and LSB) along with a Program Number (0-127). Next is the Preview button. If you press it and keep it pressed, the touch any other controller and it will let you see the value associated with this control. This is useful when working with certain DAW software like Ableton Live. Below the Mode Buttons are the Transport Buttons. They are standard assignable buttons used to control you DAW software or other Midi equipment. The bottom row has the Octave shift Buttons. I would like to see them bigger and separate from other controls. I often use Octave Shift when I play and I sometimes hit the wrong button. I also use pedals to switch octave. Next you have 3 Bank Selector buttons for the Slider section. The last button will put you in Repeat Time Division chooser mode, where you simply choose the divider associated with the Tempo and used by the Repeat and Arpegiator. The slider section is a misnomer as it really includes Sliders, Rotary encoders and a series of standard buttons. Each of then can send various midi commands as they are totally customizable. The rotary encoders are well made and feel solid. They are continuous encoders. The software in the MPK allows customized output that is usable with all software that I use. The sliders have a short travel but with just the right amount of friction they let you precisely control the values on their output. They are also assignable and customizable. The buttons are also used to select the tempo division for the Repeat and Arpegiator functions. Yes, I would reccomend that you buy this keyboard. No reserve. This is the best that I could find on the market at this point. Of course, if you don’t need the DAW controls, many other keyboards are available and most of those, especially from Roland and Yamaha, have a much better key feel. Keys are too soft: semi-weighted is a myth! This entry was posted in MPK261, Music equipment and tagged akai, Keyboard, mpk261. Bookmark the permalink. Hey man thanks for the overview! I just got my mpk261 last week and i’m slowly but surely understanding how it all works. I am by no means a seasoned midi programmer, and i have a million questions, but i’m hoping you can shed some light for me regarding the pad usage. On the first page of the edit screen for any of the pads (lets say pad 01) the parameter TYPE: has three options. They are Note, ProgramChange and ProgramBank. I think I fully understand what is meant by Note, it basically enables me to choose which note on the keyboard is triggered when i press each pad. however, i am curious about the other two options. I previously worked with the MPC2000xl and the word program meant loading as many as 64 sounds that correspond to the 4 pad banks. i would love to be able to load custom drum kits into the pads independently of what instrument the keyboard is controlling. is this possible? thank you so much for your time and sorry for the long post. i greatly appreciate what you do. You are mixing issues here. The Pads can send Program Change. But I think that what you are trying to do is re-assign the Pads using a Program Change. That won’t work directly. Basically, you want to switch between Presets on the MPK. The only documented way is to use the “Preset” button and then use the knob to choose the appropriate Preset. Hi, i having problem to save my pad colours. when chose the colour i want for Bank A to Bank D, then i global save it. After i switch off and on again, the setting all back to default. Do you know what is the solutions for this? Pad color is not saved with global save. You have to save a particular Preset. To save the Preset after you have modified the colors, press the “Preset” button and then the > (right arrow) and then choose the Preset to save. Thanks. Well written and informative! Nice review. Did you do a review of the mpk61? I would like to see it in contrast to this to see if its worth upgrading.. I felt this briefly in guitar center and felt like it had a much nicer key bed than the original. I have not played on the MPK61. I read some reviews that mentioned that they key feel was similar. I still go back to my old Casio keyboard for piano practice because I much prefer real key action, but the MPK261 is perfect for experimentation and mobile playing. Hi there! Thanks for the review it was very impressive! Only one thing, I hope you had the answer. So, I would like to change the function of those drum pads. I realised that, the pads are notes too, so when I playing some kind of notes on the midi board, I can’t playing drums on the pads – because drum pads are the notes too. Can I split the pads and the keyboards? The pads of the MPK261 can only send Note or Program Change messages. But, by default, they send on Channel 2 (for the Ableton Live preset). So you just have to program your DAW to react to drum pads on channel 2 for you drum kit, and on channel 1 for your keyboard. You could also use a series of notes outside of your keyboard range (I sometimes use the lowest notes) to trigger your drums. Is this a good controller board for slaving an Ipad-3 for live performance? I use the Akai Idoc2 as interface. I notice the MPK261 comes with Ableton lite. Will that work with the Ipad-3? Ableton Live works on a computer only. Take a look at Sample Tank from IK Multimedia for good programs for the iPad. There are many, many other good synthesizer for the iPad. Hi, Do I have the option to split the keyboard into zones with different sounds or layering something like the akai advance and code series of Maudio! Thanks in Advance!! Yes, the keyboard can be split using the “edit” function and pressing a key. It can also be split on the computer, of course. Are you able to assign buttons to control vst’s like NI Massive and change patches on the keyboard while seeing it change on the keyboard’s display?